Southern Illinois University Edwardsville has teamed with community businesses and organizations in hopes of achieving a Guinness World Record for the “longest line of books” on International Literacy Day. Organizer Stephen Hupp, PhD, professor of psychology in the School of Education, Health and Human Behavior, invites the public to help accomplish the amazing achievement, beginning with an opening kickoff at 11:30 a.m. Friday, Sept. 8 at the Outdoor Recreational Sports Complex off Northwest University Drive on campus. The official measurement will occur at 3:30 p.m.
At the kickoff event, Hupp will emphasize the value of literacy. Those in attendance will be given one of the gently-used books that have been donated to add to the line. Hupp hopes to overcome the current record, which was set in 2016 with a line of 13,410 books that stretched 1.4 miles in the United Kingdom. According to Hupp, the majority of the donated books from the world record attempt line will be given to children in Head Start programs in East St. Louis, Cahokia, Caseyville and Belleville. This massive contribution will support his ongoing Kid Books Project, which aims to collect one million gently-used books for children in local Head Start programs, ages five years and younger. Books will also be donated to the Honor Society of Phi Kappa Phi, the Greater St. Louis Book Fair and other fitting causes. Local organizations that have provided large amounts of books to the effort include the Edwardsville Public Library, St. Mary’s Catholic School in Edwardsville, Liberty Middle School, St. Jacob Elementary, St. John Newman Church, St. Andrews Church, the Christian Activity Center, Tri-Township Public Library and Afterwords Books. 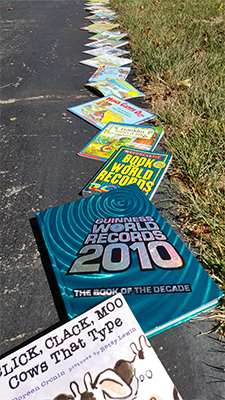 Photo: SIUE invites the public to participate in its “Longest line of books” Guinness World Record attempt, with gently-used donated books creating a path for miles.